It’s never a dull day in the AAUW archives. I never know what treasure I am going to find in our fellowship files. Each fellow is unique. Each one has their own story. In Helen Claudia Henry’s 1955–56 International Fellowship file, I came across two letters written by Jonas Salk, the virologist who discovered the polio vaccine. As I held the letters in my hands, I could not believe that letters from a world-famous scientist are here in the AAUW archives. As I dug deeper, the story of the letters began to take shape. Click here to read the full story about this new discovery in the AAUW Archives. Last weekend, I got the opportunity to attend my first MARAC (Mid-Atlantic Regional Archives Conference) event in Philadelphia. The theme was “Art and Advocacy along the Delaware,” and as such, many of the conference sessions dealt with preserving and advocating for art in the archives. Two of the most interesting sessions I attended dealt with the unique situation of artists’ records and complex digital artworks. The list is quite large, and growing, now that we can include digital files into the archive of today’s artists. However, one of the most thought-provoking questions raised during this session was, “How do you decide what is considered archival and what is considered a work of art?” This question really boiled down to the essence of the object, and where it would serve its function best: will it be used more for research or criticism? Does it need the special care that would be given to it if it were classified as a piece of art? This also points to increased collaboration between archivists and curators at institutions. 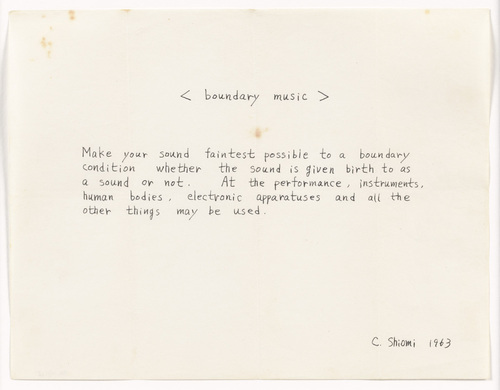 < boundry music > : Instructions for a performance art piece by Mieko Shiomi. Does this belong in the archives or with the curatorial staff? It’s safe to say that I came away from MARAC 2013 with a newfound appreciation of art archives in the 21st century. Like in many other places: collaboration, technology, and cooperation will be the road map for the future of art in the archives. This past week, the Library of Congress’s American Folklife Center hosted a two-day conference titled Cultural Heritage Archives: Networks, Innovation & Collaboration. With attendees from all across the country and the world, this symposium was a fertile arena for insight and discourse on many pertinent issues related to the design, management, and administration of cultural heritage archives. A wide variety of speakers from all sectors of the archival community presented inspiring papers on numerous topics. Really, there is too much to say about this symposium; so much so that justice cannot really be done in a blog post format. This is a polite way of saying you really should have been there. Danna Bell-Russel, Educational Resource Specialist at LOC and SAA President, presented the first keynote address on the first day, focusing on ways that archivists can bridge connections between institutions and disciplines. The first session saw many papers on use and users of cultural heritage archives from U. Oregon, Oxford, U. Colorado Boulder, Universite Paris Diderot, U. Alberta, and U. North Texas. FULL DISCLOSURE: I wasn’t able to make the first part of the day’s festivities, so I’m basing this off of the symposium program. How should the EAC-CPF standard be applied to link archival metadata? How should social media be used to expose archival collections, especially regarding collections that have significant cultural importance? What’s the best way to catalog music archives with regards to quick access and use in educational settings? A poster session featured many great studies on archival programming, but the most interesting was a poster on Traditional Knowledge Licensing and Labeling presented by Jane Anderson. Learn more about TK Licenses here. The second day kicked off with an absolutely fabulous key note address by Sita Reddy about the decolonization efforts of indigenous peoples regarding their cultural wisdom as captured in the Hortus Malabaricus. The abstract of her presentation can be seen here. On a silly note, apparently there’s no LCSH heading for bourbon. Be sure, I could go on and on and on about the wonderful talks presented at the symposium, but that could take ages. HOWEVER, I will say that what was most stirring about this symposium was the continued recognition of the importance of collaboration in the cultural heritage community. Be it with ethnic or cultural groups, be it with archival users or audiences, artists, collectors, IT staff, archive administrators, or what have you, the repeated anthem of the two-day symposium was that archivists must constantly seek out new and innovative ways to collaborate with internal and external parties to ensure that the collections survive in perpetuity and gain new life through continued access and use. One point was brought up that I thought also bears mentioning. During a Q&A session, Timothy Powell of the American Philosophical Society declared that he felt that a group was missing from the day’s proceedings and that the group was digital humanists. This struck me as odd as the statement appeared to come from an “us-them” perspective that set up digital humanists as external to archivists. I feel however that the digital humanities is a broad, reflexively-inclusive term that has within its scope all who work with the humanities, be they scholars, archivists, librarians, &c. Considering the increased prevalence of digital formats of preservation and access that occur in the archival community, one is hardpressed to find a humanist that doesn’t, in one form or another, operate in the digital world. In this regard, I disagree that the digital humanities were unrepresented; rather, many — if not all — of the attendees at the symposium are a part of the digital humanities, they just might not know it yet. To wrap up, the symposium was a great forum of ideas on a wide array of topics in the cultural heritage archival field. Great perspectives were shared and I hope to see many excellent collaborations emerge from the proceedings. Be sure to keep your ear to the ground as the LOC will likely make videos of the symposium sessions available online through the webcasts site. For even MORE cultural heritage archives fun, be sure to check out the symposium’s twitter feed at #chas13. Cupcakes are out. Archives are in. The best two days of the year have arrived. What is it, you ask? No, it’s not my birthday. It’s not even Christmas. Need a hint? Fine I’ll tell you. It’s the Library of Congress National Book Festival! Ok, before you stop reading, let me explain why I always get so excited during this time of year. Yesterday and today the Library of Congress hosted their 13th annual National Book Festival on the National Mall. This is where passionate authors congregate to discuss the process of writing their new book and their devotion to the topic. This year some of the topics included: families coping with disabled children, Mexican home cooking, homosexuality and religion, and learning how to motivate others by selling. The best part of the National Book Festival is listening to an author, unknown to you, and becoming completely engrossed in their life and their story. It is invigorating leaving the National Book Festival interested in topics you would have never even thought twice about. Ok, now that you know the background of the National Book Festival (and are counting down the days ’till next year’s event), I’m writing today to talk about the new trends I learned while attending the National Book Festival. No, I did not learn new fashion trends (although, I did see a family sporting some fashionable, yet very practical ponchos). Anyways, I’m getting off topic. This is the place where I realized that cupcakes are out (we knew that for awhile) and archives are in. Archives? Seriously? Yes, archives. At the National Book Festival yesterday, it seemed as if almost every speaker used the word “archives” during their presentation. It was used not only at the “History & Biography” tent, but at the “Contemporary Life” tent too. Is it just becoming the new buzzword? Or is the general public finally realizing the importance and becoming interested in archives? I think it is a combination of both. After listening to Linda Ronstadt talk about her musical career, I headed over to the “History & Biography” tent. Film historian, Christel Schmidt, discussed not only the subject of her new book, Mary Pickford: Queen of Movies, she also discussed researching in film archives to write this book on the famous silent movie actress. Listening to Christel Schmidt talk about archives just reinforces this trend of the general public wanting to know more about the behind the scenes process. I jumped from the silent movie era back into 2013 when I went to the “Contemporary Life” tent again. This time I was there to listen to Bonnie Benwick discuss The Washington Post Cookbook: Readers’ Favorite Recipes. Ok, you might think, how can cooking be related to archives? Let me tell you. Bonnie Benwick discussed that in order to find the content for this new book, the Washington Post staff not only looked back in the newspaper’s archives, but they contacted readers to look back in their own personal archives. This is just another example of how archival items can be used today for “Contemporary Life” purposes. The votes are in. The people have spoken. Archives has been named the new trend of 2013. I only hope, that this is not a trend which will quickly disappear as fast as slap bracelets. In fact, I hope this is not a trend at all, but an awakening. energize the discussion of ethnographic archival thought and practice by presenting fresh and dynamic strategies for contemporary archival realities. The symposium is scheduled to included panels on the use of cultural heritage archives, archival description standards, preservation and digital stewardship, collaboration, resources, and education, all of which will be attended by a selection of academics and professionals from the archival and cultural professions. Information on the symposium is available here. The event is free and open to the public, but registration is required. Registration will be available at there website sometime in August. On another note, the “Calendar of Upcoming Events” is suffering some issues. Please be patient.